The Meywalk 2000 Gait Trainer from Meyland-Smith in Denmark is the improved version of the famous Meywalk walking support. The height of the trunk support and seat are now adjusted quickly with spanner grips. 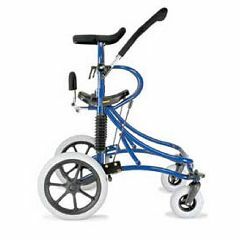 The seat and trunk support has spring suspension to encourage a more natural gait pattern. For transfers, the seat unit can be lowered by using a swing bar, making it easier for the user to get in and out of the walking support and putting less strain on the carers. Once the transfer is complete, the swing bar is pushed down and the user is lifted into the standing position. The body posture of the user can be set in any position from vertical to 15° forward tilt. The Meywalk 2000 Medium is for children from 7 to 14 years of age, and Meywalk 2000 Large is for young people from 14 years of age and adults. Meywalk 2000 is made with materials of high quality, that guarantee long life, maximum reliability and a minimum of maintenance. Meywalk 2000 is therefore suitable for indoor as well as outdoor use. how much will it cost simulator delivery to Moscow?